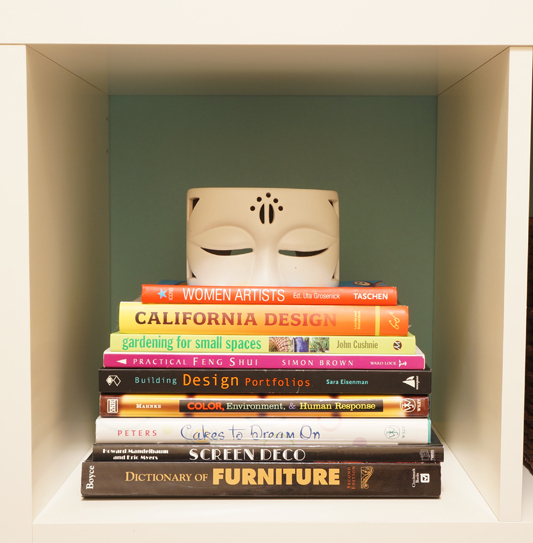 I’ve been having a bit of fun playing with the styling of my new office bookshelves. Had to make sure you were still paying attention. 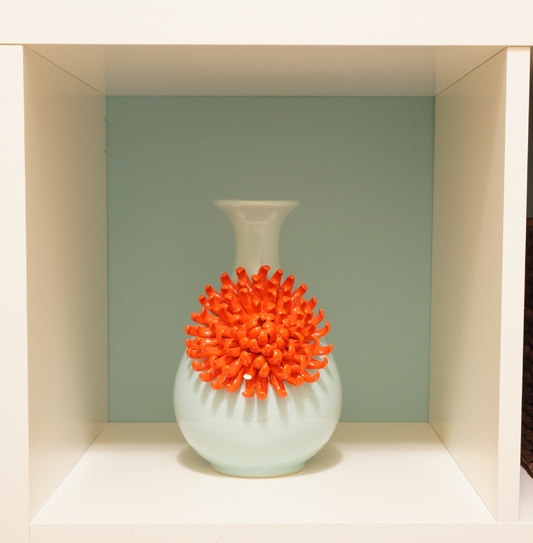 This pretty vase is one of my Black Friday Anthropologie deals! I’ve been eyeing this vase for ages, but couldn’t bring myself to buy it at full price. It’s originally $28 (which isn’t a lot for Anthro), but I think $11 sound better, don’t you? As you may have noticed, there is one broken petal, but with matching paint dabbed on the broken edge, no one will even notice. Anthro sale rack FTW*! *FTW= “For the win” I blame Hubby for this being in my vocabulary. 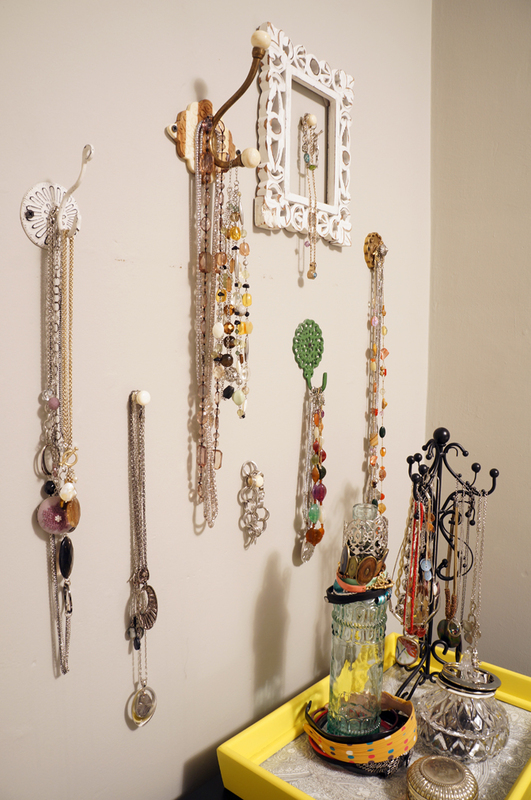 I’ve been talking about how to organize my hoard of jewelry for what seems like forever and a day. I had been thinking about using frames to display it all, and I even tried a version here. HOWEVER, I’ve realized, when I drag my feet on a project, it usually means that something just doesn’t feel right. So I finally scrapped that plan and went a new direction: hooks. 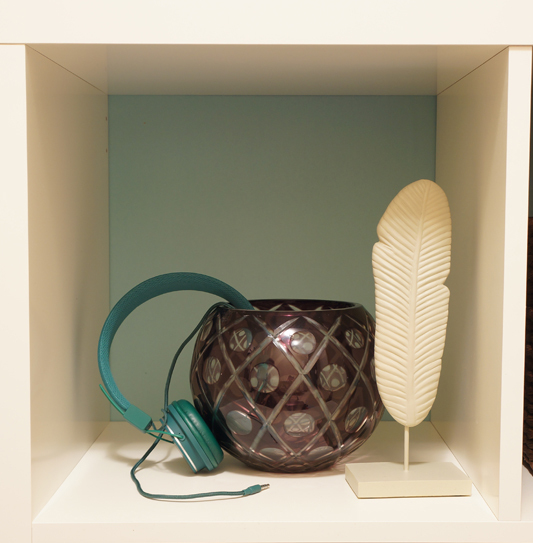 The idea for a collection of vintage-style hooks hit me when Zara Home went live in the US a little over a month ago. They have so many beautiful options! After waiting so long for inspiration to hit, I was in the mood to git-r-done. 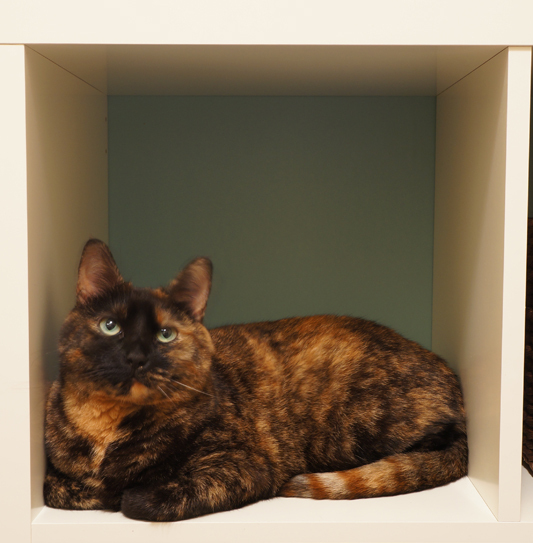 Waiting for a shipment from Zara Home, no matter how pretty it may be, wasn’t what I wanted (sorry Zara!). 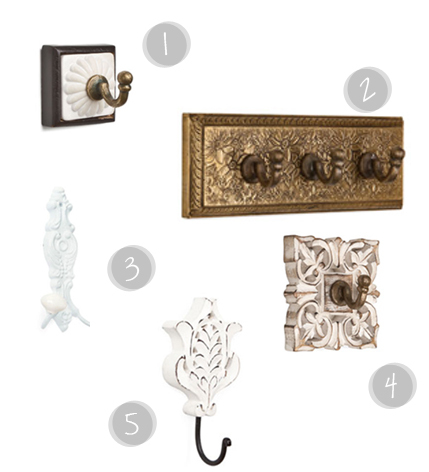 Glutton for punishment, I headed over to my go-to place for vintage style hardware: Anthropologie. That place is dangerous. As in walk-through-the-doors-and-surrender-your-wallet dangerous. Per usual, I left spending more than planned, but I scored a pretty awesome collection of vintage inspired hooks to showcase my necklaces. I went rogue and started hanging them without planning it out first. Thank goodness it worked out- plaster walls aren’t very forgiving. 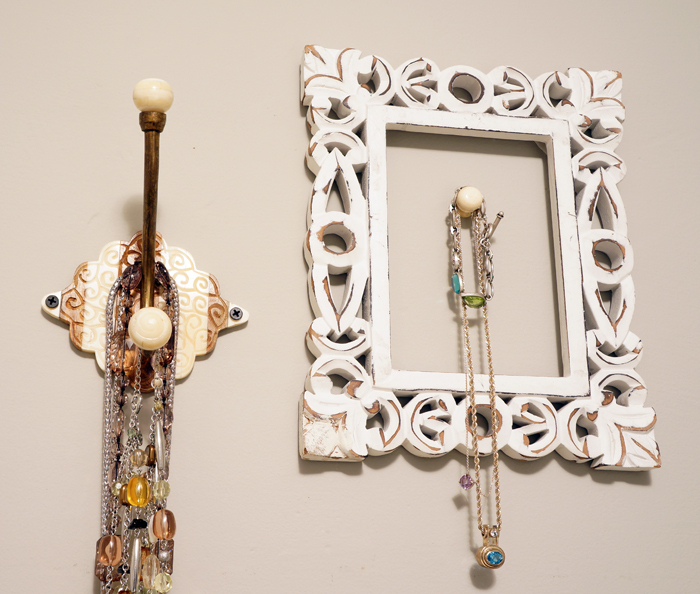 I just love the textural interest all the different hooks add. The frame was actually an unplanned last minute addition, but it’s one of my favorite parts. It’s currently showcasing 2 beautiful necklaces from Hubby. Not the biggest transformation, but it’s just a breath of fresh air. Certainly makes my 6am wardrobe accessorizing a bit easier. I have a relatively high tolerance for “ick,” but I totally discovered my limit last night. In a surprising bout of after-work motivation, I decided to get started on my basement organization project (that I embarrassingly shared with you here). 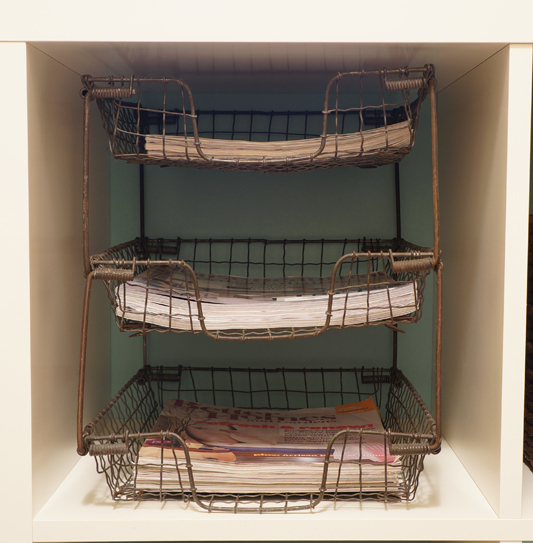 I was an organizing ninja…. …under a pile of wrapping paper, I discovered a dead mouse. But, like I said, I have a high tolerance for “ick,” so that barely phased me. We’ve found one other dead mouse in the house, and a few dead ones outside, but no live ones thankfully. I think our 2 killer kittens would promptly make them sorry. What really icked me out, though, was when I tried to dispose of said mouse. I covered my hand with an inside out plastic bag and several sheets of paper towel and picked up the not so dearly departed. Well, he left me a gift… of his fur stuck to the concrete floor. ICK ICK ICK ICK ICK. I know, not the image you want, so I’m sorry, but I had to vent. Bleach to the rescue thankfully, but I may be scarred for life. And I may be a wee bit melodramatic, but at the very least, I was scarred for the rest of the night. It was a traumatic house evening all around. When I emerged from the depths of the basement to announce our ‘furry’ friend to Hubby, the smoke alarm started going off. On Chopped, they always make the error of not heating up the grill pan enough, so Hubby overcompensated. Our steak dinner that Hubby was cooking got a little too seared on one side. In his defense, the inside was cooked to perfection, but it took a while for the smoke to clear. The last semi-traumatic even t involved my jewelry. 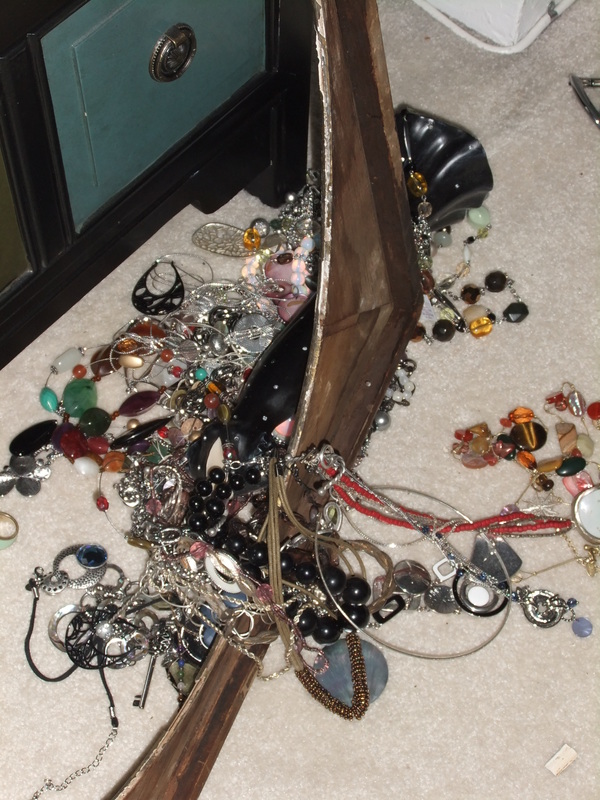 Somehow the Hubs walked into the small chest in the bedroom where my throngs of jewelry live while they eagerly await pretty frames to live in. Well, the jewelry and the dishes and holders and a leaning frame acted like dominoes and all went a-toppling. Must be a sign- I guess I need to get moving on those frames. To cleanse your mind of any unpleasant images I may have caused, I’ll leave you with a few images of organizational prowess. You Will Not Win, Winter!! I am solar powered. Warm sunny days motivate me to get sh*t done (like yesterday- yay!). The way I figure it, if I vow to you that this winter will be different, then I have you guys to be accountable to. So here goes! I have 2 rooms in my sights currently: my bedroom and my basement. 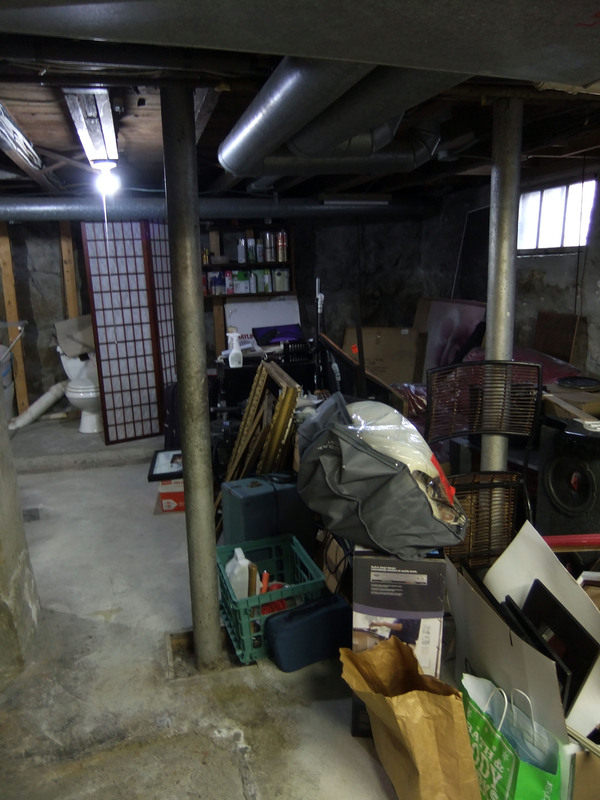 I already mentioned my bedroom in this post , but the basement has been my deep dark secret (pun intended)…. until now. Note the random toilet. Classy, no? I’m a gal who always has at least 1 project going on. Now that we have a house, my projects are bigger, messier, and take up much more room. oops. The dining room has been the work room up till now, but that makes it tough to have guests over for dinner. If you’re anything like me, not having guests over, means that the house doesn’t get as clean as it probably should…… “Who, me?” Yes, you. Well, I miss having friends over for dinner and I miss having the house ready to show off to guests (I’m an interior designer here, I see my house as a living 3d portfolio). So what’s the solution to my woes and what does it have to do with the horrific basement shown above? I’ll give you a hint- it involves a LOT of organizing, and some craigslist shopping. 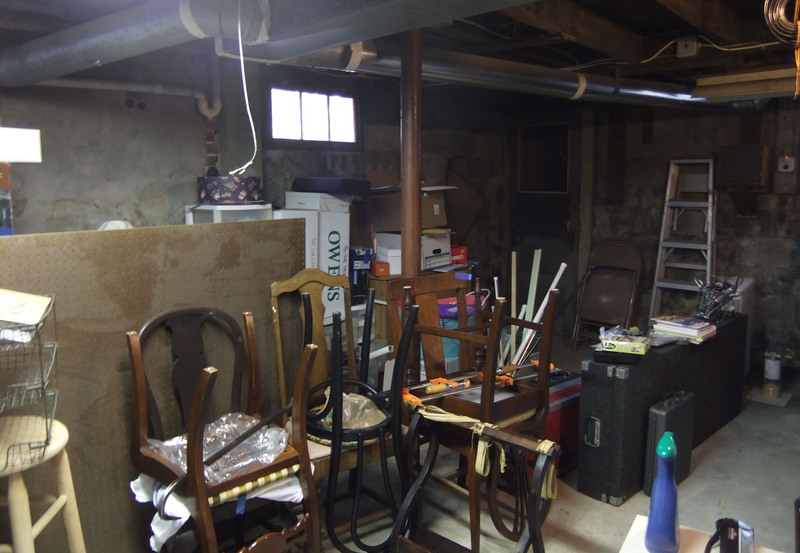 I’m tackling my basement once and for all! 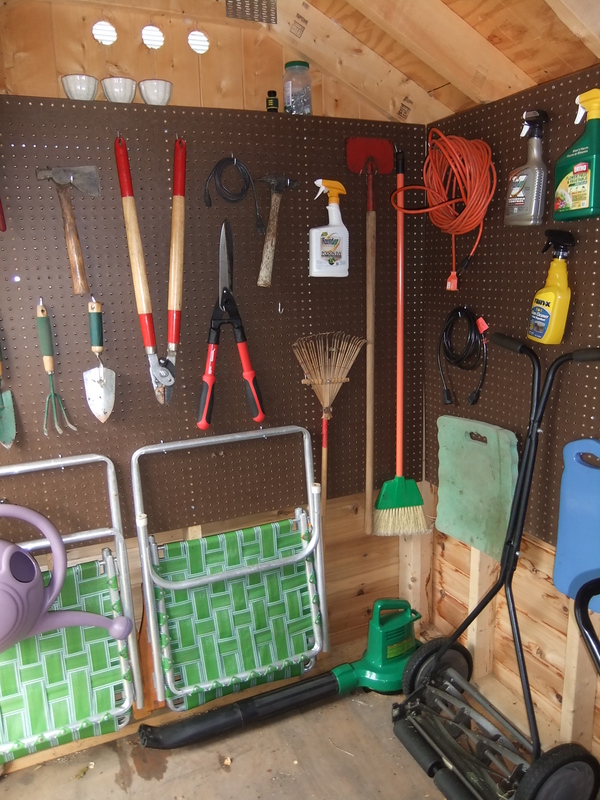 First and foremost, there will be a work/project area with all my tools organized (lets pause for a sec and appreciate those 2 beautiful words: organized tools…. ). 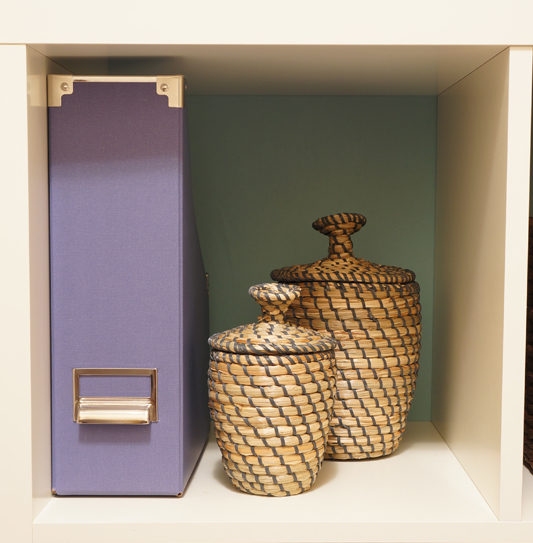 There will also be a dedicated, organized storage area, and a totally reorganized laundry area. Do you see a trend? ORGANIZED!! IF I’m feeling really ambitious, I might actually make the random toilet in our basement feel less random, although I really have no idea how yet. 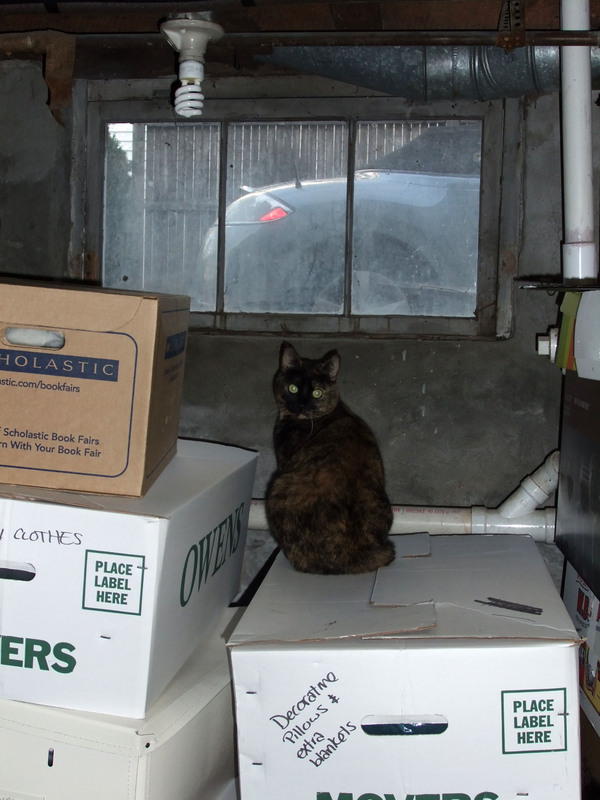 "Oh, hello, I'm not causing trouble down here, I swear"
The first step is the toughest though… purging and organizing. I forced myself to get this started last weekend and donated about 10 tons of clothes to Savers (like GoodWill or Salvation army). When we moved, we got rid of a lot (believe it or not), but we still have stuff that we kept ‘in case we needed it’ that we haven’t used in a year. If I don’t remember you exist, you don’t need to take up space in my basement. Once I do a major purge and get started on the organizing, craigslist is going to help me find some pieces to organize and maybe give a little pizazz to my work area. My dad mentioned that my Grandpa used to use old dressers to hold his tools and such- I love this idea! Power tools stored in a cool old dresser, maybe painted an awesome color? Doesn’t sound like me at all. If I’m cooped in the house all winter, I might as well make it productive. Now I just have to force myself to dig in and do it! 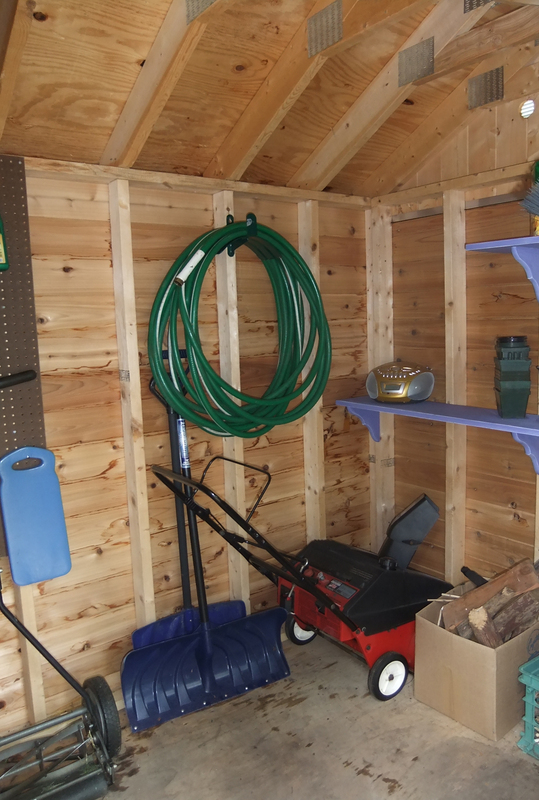 Do you have any cold weather projects planned? 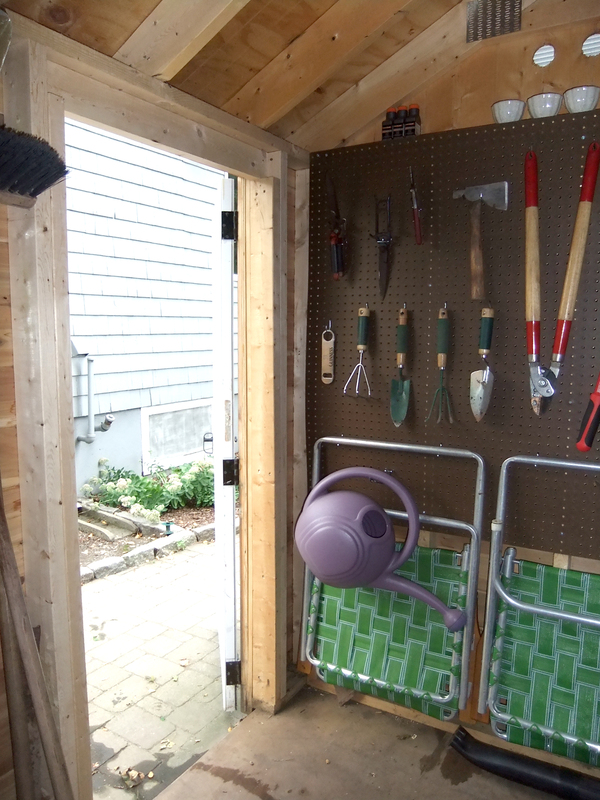 At long last, our small shed has become an organizational masterpiece. Ok, so I may be exaggerating a TOUCH… but it’s looking good. 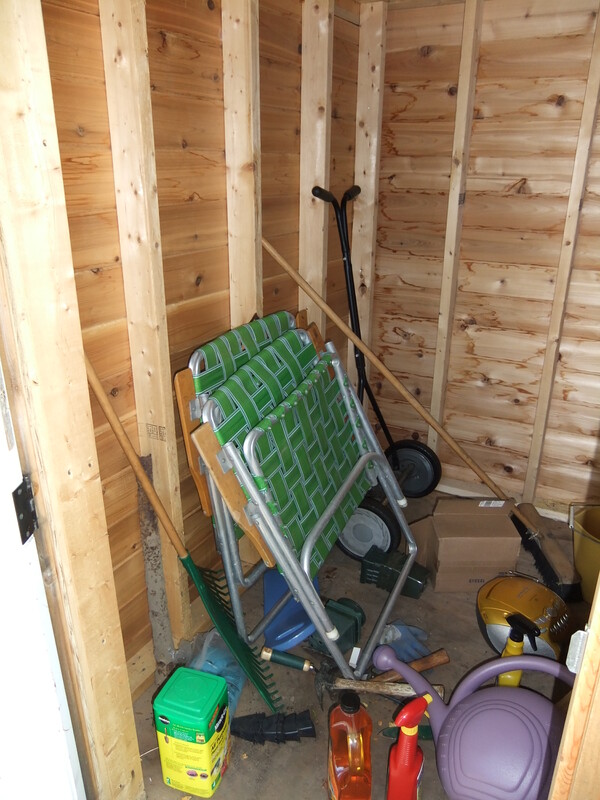 The shed only had 2 steps worth of clear floor space. Totally functional, right? Well, that’s why I fixed it. Wooden shelf and brackets from my childhood bedroom. 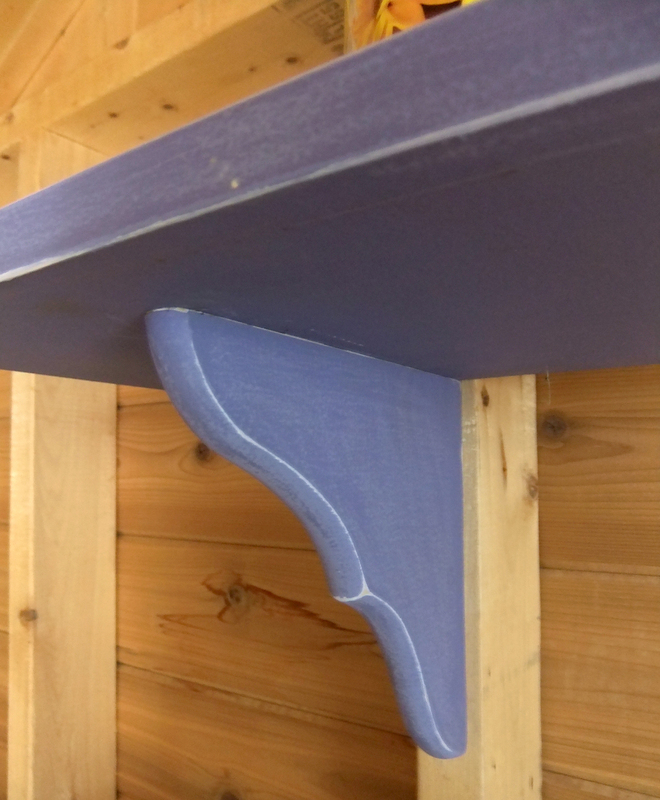 You got a sneak peak of the peg board here, but it’s about time to check out the full outcome. I decided not to repaint the shelves and left them the original purple of my childhood bedroom. The 2 shelves were once upon a time a single shelf that spanned the length of my bedroom about a foot and a half from the ceiling and was home to my stuffed animal collection. I was cool like that. After suffering through the abuse of a child/teenager’s room, then getting chopped in half and transported to Massachusetts, the shelves were a little worse for wear. Sandpaper to the rescue! I roughed up the edges a bit and made the scratches blend in. 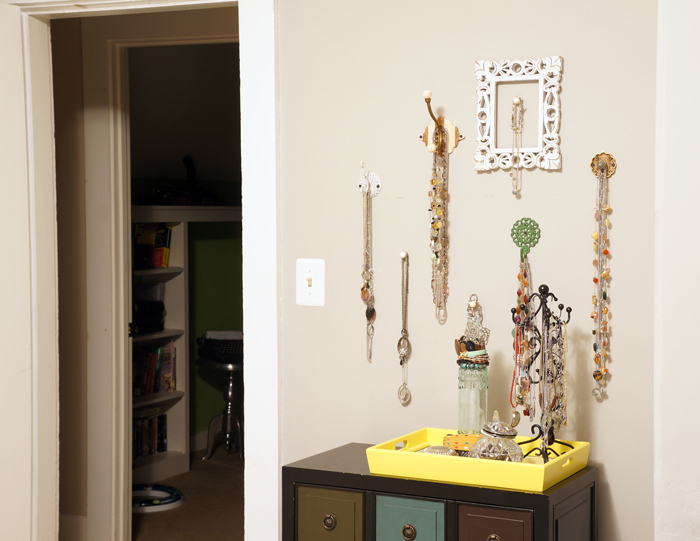 I’m blown away by the amazing response I got from my Pinterest Challenge project! You guys are seriously awesome! I’ve been keeping myself so busy in the past few months that I can’t believe the summer’s almost over! I refuse to believe it, especially considering it didn’t feel like summer until late June. After my Pinterest Challenge project and the projects leading up to it, I was in desperate need of a break, so last weekend, for the first time in my recent memory, I decided I was going to sleep in (till 9), not go tag-saling and have a weekend to do NOTHING. Of course by nothing I mean all the laundry, grocery shopping and doing a jewelry party (through my less than part time Lia Sophia business), but for me that’s a lazy weekend. And since objects at rest tend to stay at rest, I’m just now getting to you. So, it’s time for a project tease! 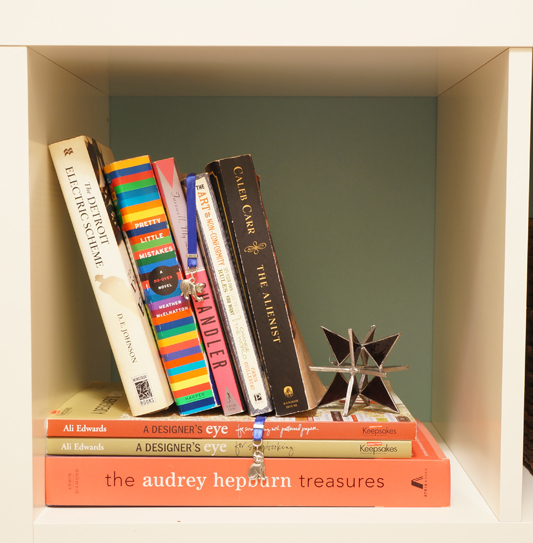 Fact: Organizing is fun. For me at least. Most likely because disorganization makes me twitch. With that being said, I’ve been severely neglecting my organizational responsibilities. In a small house, organization is paramount… and I currently have overflowing closets and a basement mess I wouldn’t wish on my enemies. So I have to enjoy the pieces of organization that I’ve accomplished so far. 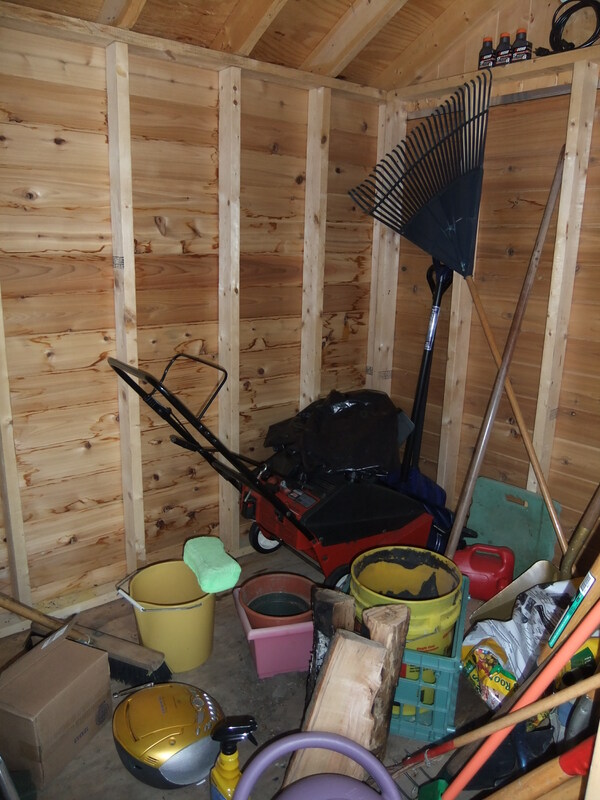 Remember when I mentioned my intentions of a fabulously organized shed here? Well, it’s half-way there! 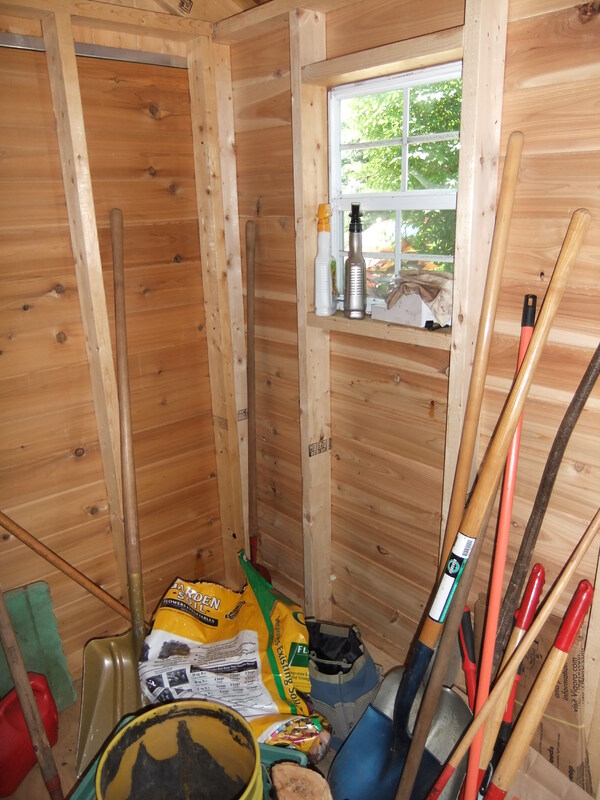 There maaaay be more junk in there now too after our latest yard projects. Just maybe. Woo Hoo! On the right track and beyond easy to put up. 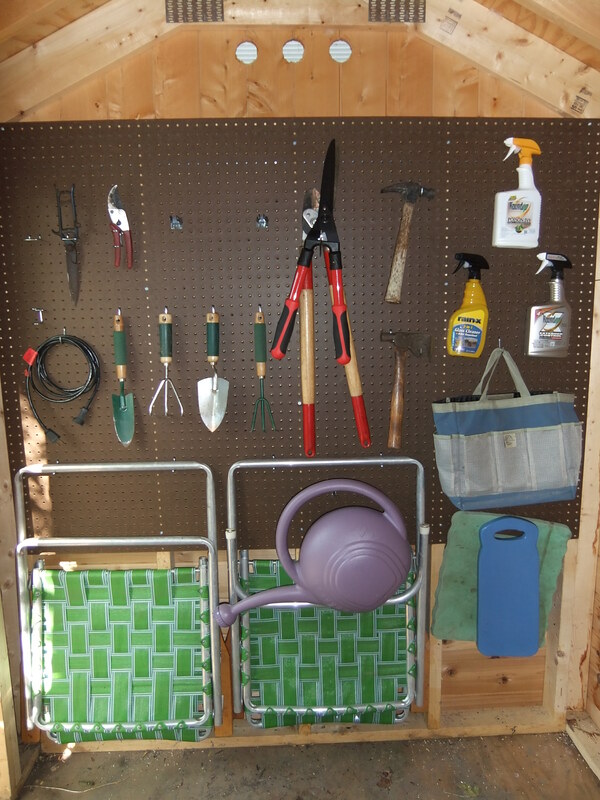 The hardest part of this project was FINDING the pegboard at Home Depot. 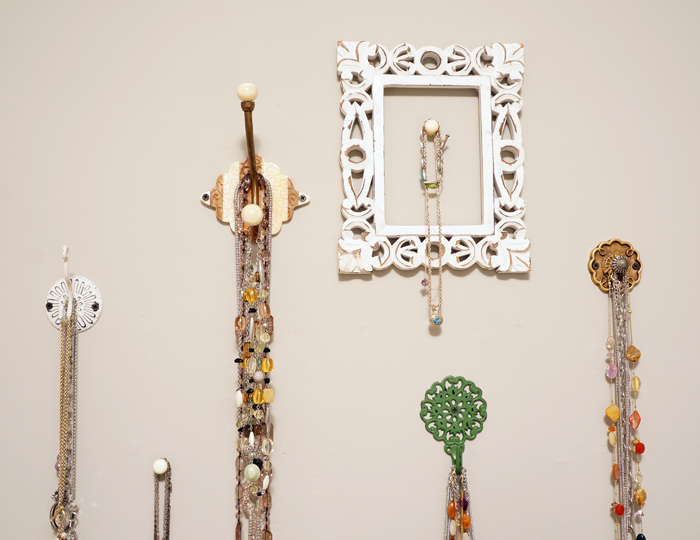 They hide the board with decorative moulding, but the pegs and hooks with the organizational items. Totally logical, right? 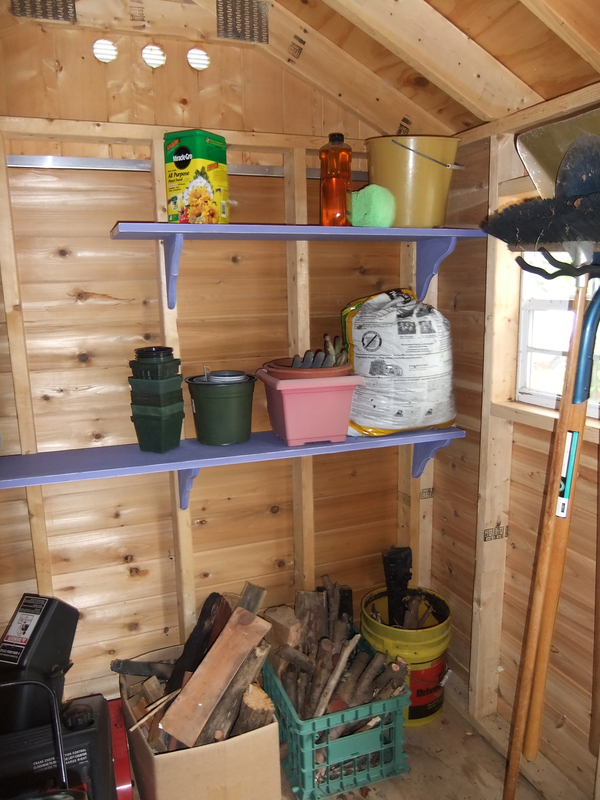 The other side of the shed is going to be getting shelves leftover from my childhood bedroom (and still painted accordingly) as well as a few more organizational fixtures. I can’t wait to be able to walk in there again! Seeing the floor would be a nice bonus, too. 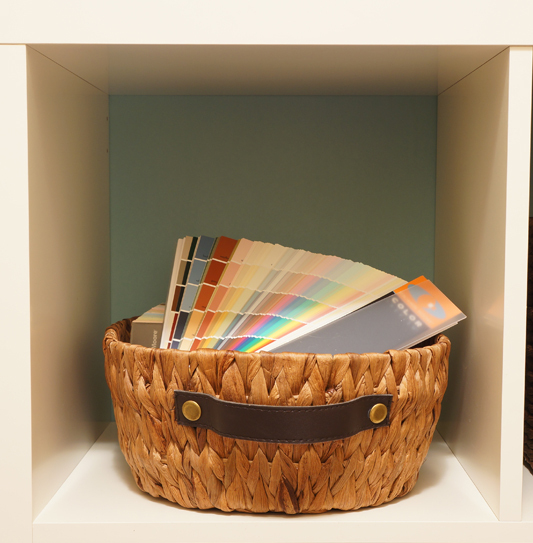 Don’t you love organizing? Or is it just me?